1. The granddaddy of them all is Armin Brott’s The Expectant Father (Abbeville Press – Updated Third Edition), the classic book (and following six bestsellers) and pregnancy and babies from a new dad’s perspective. Armin is both poignantly funny and pragmatic, providing common sense answers to many questions news dads will have. It’s as complete a book as any you will find with almost 400 information-packed pages that go from conception to bringing the baby home (“What do we do now?”). For dads who want to dig deep on the issues that will be most important for their gender, this is the book to get. What to Expect When She’s Expecting. Grant documented the his first child’s pregnancy and gives you the benefit of his experience on the what things to watch out for as you swim the uncharted waters of OB/GYN visits and female biology. 3. 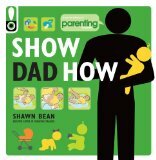 Parenting Magazine (Weldon Owen) has a new picture book out called Show Dad How. At first glance, many dads will be put off by the airplane emergency pamphlet graphics that seem either patronizing or too clinical. The graphics aside, however, we found this book to be easy to navigate with easy-to-bite-off chapters an sections that make it an easy read for the topics you want answers to now. 4. John Pfeiffer’s You’re Going to Be a Dad! (Adams Media! (Adams Media) is another good book that covers in humorous and frank detail all the ins and outs of pregnancy from OB/GYN visits to advice on naming, all written for the dad-to-be. 5. A little more serious is I’m going to Be a Dad: Now What? by Craig Bair by Craig Baird (Atlantic) that combines complete coverage of pregnancy through the first half of the book and the basics (sleep, diapers, feedings and the like) for infants up to 2 years. It’s great to see a lot more choices in the Pregnancy Section for dads. While there is much overlap between the information covered here and what you’ll find in the moms’ books, it only makes sense that these books will involve dads that much more in the pregnancy and in the early years of their new child.